This photo is a good example of the limitations of a 50mm lens on a crop-sensor camera*. 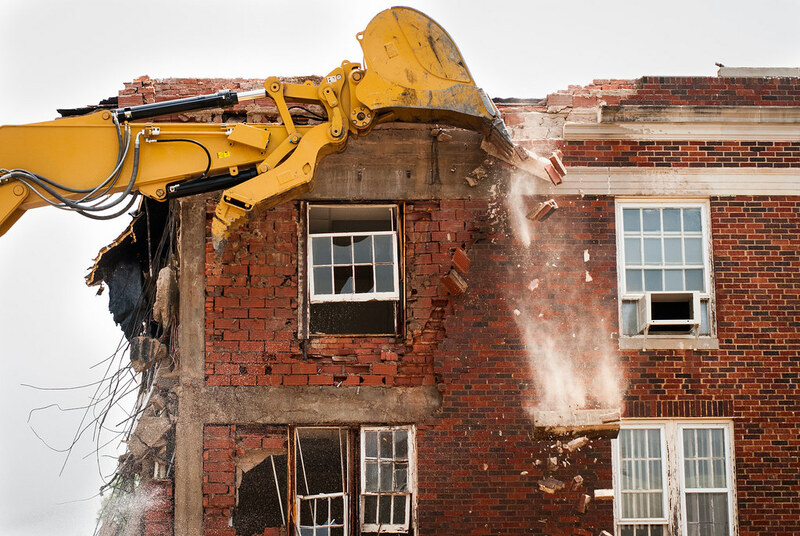 I went to see a demolition crew tear down a building on campus recently, and brought my trusty D200 and 50mm 1.8G to document the experience. Thankfully I had my iPhone as well, because there was just no way to realistically show the scale of the destruction with that particular body/lens combination. With the limited field of view offered by this lens, I would have had to stand way, way back from the building in order to get enough of the action in frame. For example, this photo was taken from across the street, and while it is kind of interesting there are many things it does not show: the building, the excavator, the existing rubble, the crews of workmen, and the spectators. In other words, there is almost no context for the image, which severely limits its utility. My iPhone, by contrast, was able to capture the full scale of the scene with remarkably clear detail. However, the challenge that every photographer faces is to work within his or her limits in order to produce the best images possible. My solution was not to walk a block away and try to squeeze everything into my DSLR’s field of view, but to re-think the situation entirely. How could I utilize composition, framing, lighting, and other elements of photography to capture a compelling picture? While my iPhone was fine for a large-scale view of the situation, I decided to use my D200 to capture a more intimate and personal image instead. The open maw of the excavator looks almost like a massive jaw, ready to consume whatever stands in its way. The debris falling on the right side gives the viewer (I hope, anyway) a sense of motion and controlled chaos. Decaying window frames and the shell of an A/C unit speak to the overall poor state of the building. And the torn-out wreckage spilling forth on the left-hand side teaches the viewer the sheer power of the wrecking forces at work. Clearly the excavator has been busy, and has much left to do. That’s my hope for this picture, anyway. I’m not sure if it works and conveys everything I want it to, but if nothing else I at least got to watch a building get destroyed. And photographs or not, it sure was cool. *A simple Google search will turn up all kinds of information on crop vs. full frame, but this video does a better job of discussing the matter than most I have seen. Nice catch of those falling bricks. It’s all about timing. I once took a photo of a kid popping a 20 foot high wheelie out at Salt Creek and it took me seven tries to get it just right, where you only had this once chance to catch the fall of the debris. Wow! I bet our Narrator loves that one!